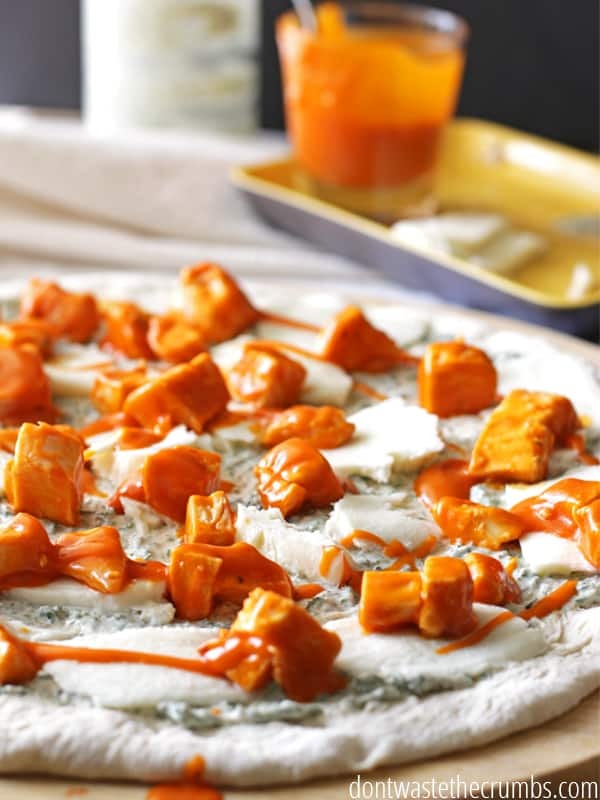 Buffalo Chicken Pizza: A Crazy Good Recipe! 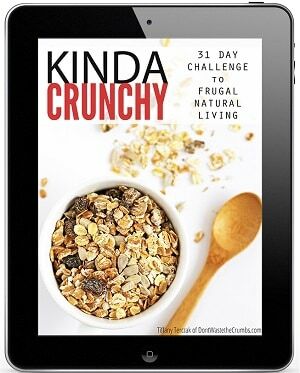 You are here: Don't Waste The Crumbs » Recipes » Main Meals » Buffalo Chicken Pizza: A Crazy Good Recipe! Back when I was a student at the University of Delaware, I had a routine every day. After my 11:30 class, I’d walk down Main Street and visit the most amazing pizza shop in the entire world: Margheritas Pizza. For $2.50, I could walk in and grab a one topping, ginormous slice of buffalo chicken pizza with a soda. It was heaven. My part-time job paid just enough to fund my addiction to New York style pizza…. Not to mention, coffee. 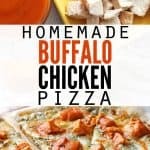 While I’d originally only been in love with their pepperoni pizza, my friend introduced me to their buffalo chicken pizza. 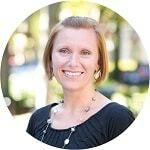 At first, I was completely ooged out at the thought of hot sauce and chicken on pizza…. It just didn’t seem natural. However, after trying one slice, I was hooked. It was like the most amazing thing ever. Take a killer pizza and combine it with boneless buffalo bites. Anyhow, fast forward a few years and you’d find me married to Mrs. Crumbs and in California. Desperate for good pizza (none around here), we began formulating our own recipe. The easiest pizza sauce ever and homemade New York Style pizza dough are the tried and true recipes (several years over) we use on Friday nights. 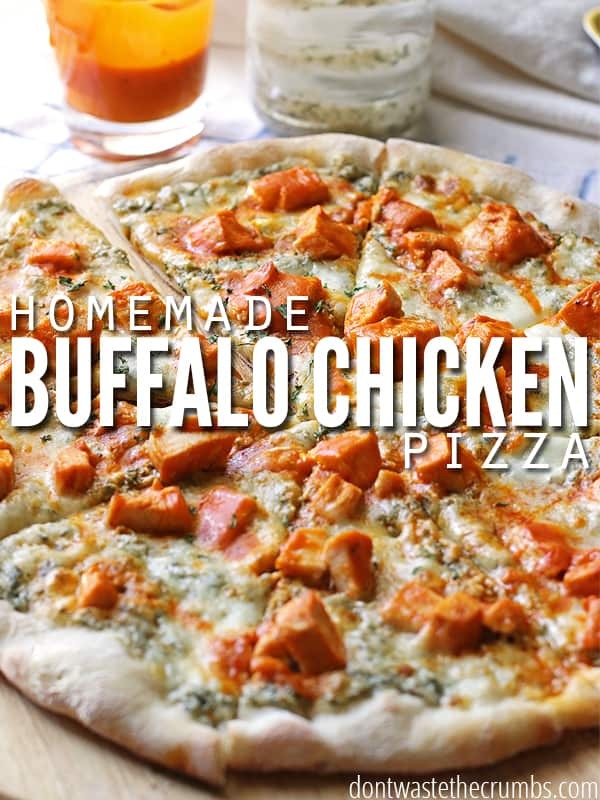 While we love our pepperoni pies, we wanted to see if we could replicate that amazing buffalo chicken pizza from my college days. 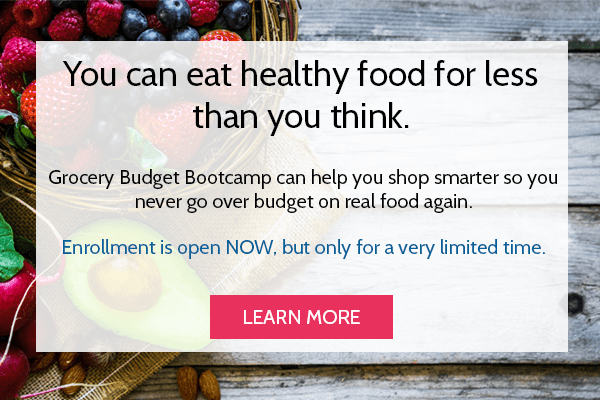 After a few tries, we were able to dial it in with success with one exception: real food. Beyond the crust, we use homemade dressings. Depending on what we have in the kitchen, it’s either homemade ranch dressing or homemade blue cheese dressing – both are amazing. This pizza is simple, easy and every single one of our friends request that we make this on pizza nights. Our friends will not steer you wrong. We’ve found that starting the dough at the same time you preheat the oven not only gets the stone hot, but provides a warm environment for the dough. Win win. Bake one chicken breast in the pre-heating oven for 25-20 minutes. Win x3. Set the chicken aside to cool and bump up the oven to the highest temperature you can. Ours caps out at 550F, but a higher temp means a crispier crust. When the dough has doubled in size, shape into your favorite pizza shape. Tip: Mrs. Crumbs will attest that it takes SERIOUS practice to make circle pizzas. I’ve been doing this for several years, so circles come easy. Mrs. Crumbs however tends to make triangles. The pizza will be great, no matter the shape! Chop the cooked chicken breast into pieces and toss in your favorite hot sauce. Tip: Most hot sauces are comprised of a few real food ingredients. 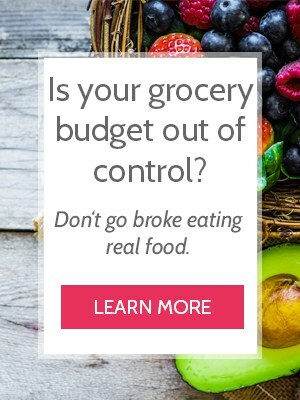 If you can’t find a brand without preservatives, try your hand at making your own! Put away your marina sauce and grab (or make) your choice of ranch dressing or blue cheese dressing. 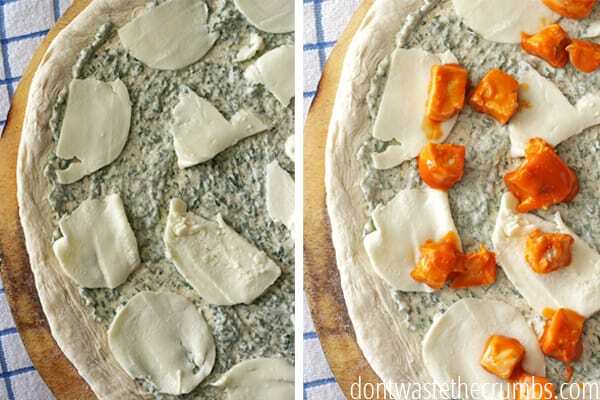 Smear a thin to medium layer on your pizza dough. Tip: The thinner the crust, the thinner your sauce needs to be. Thicker crusts can handle more weight, and therefore more sauce. If you have thin pizza but want more sauce, serve it on the side. Top with fresh mozzarella, crumbled blue cheese (optional, if you didn’t already put it in the dressing) and the chicken that was tossed in the hot sauce. Drizzle a little bit of extra hot sauce on top of the pie before you place it in the oven. Depending on how spicy you like your buffalo chicken pizza. Bake until the cheese is nice and bubbly, 4-7 minutes. Allow the pizza to cool for 2-4 minutes before slicing (this awesome pizza cutter eliminates the issue of slices without cheese!). Prepare the pizza dough as directed. Bake one chicken breast in the pre-heating oven for 25-20 minutes. Set the chicken aside to cool and bump up the oven to the highest temperature you can. 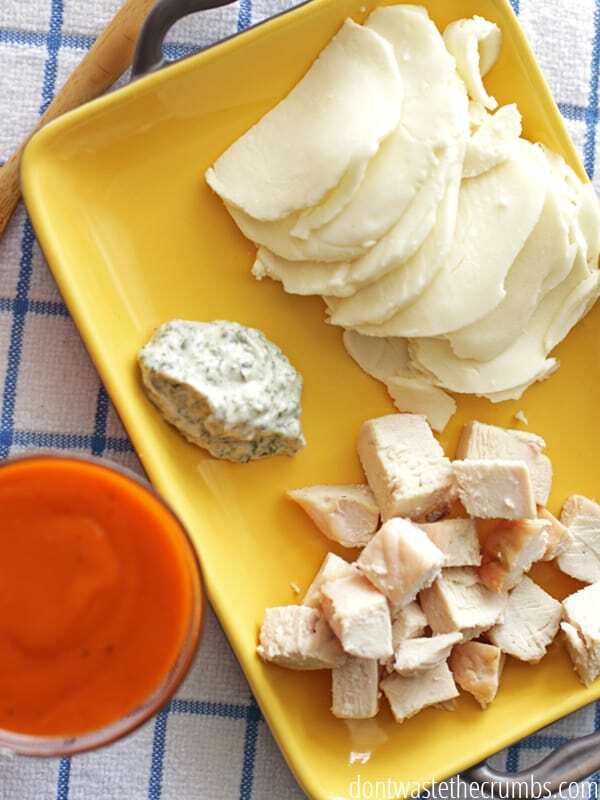 Chop the cooked chicken breast into pieces and toss with 2-3 Tbsp of buffalo sauce. 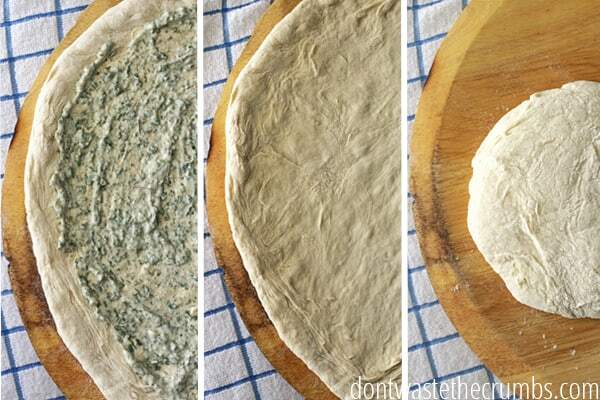 Smear a thin to medium layer of homemade dressing on your pizza dough. Top with fresh mozzarella and the chicken that was tossed in the hot sauce. Drizzle a little bit of extra hot sauce on top of the pie before you place it in the oven. Bake until that cheese is nice and bubbly, 4-7 minutes. Allow to cool for 2-4 minutes before slicing. I know chicken breast isn’t the most frugal option, so feel free to use 1-2 cups of shredded chicken. Just remember to keep your toppings appropriate to the thickness of your crust. We REALLY prefer the taste of fresh mozzarella on our pizza, but you can use shredded mozzarella if that’s what the budget allows. 4 ounces seems to do the trick, but you can up it to 6 if you like it on the cheesy side. 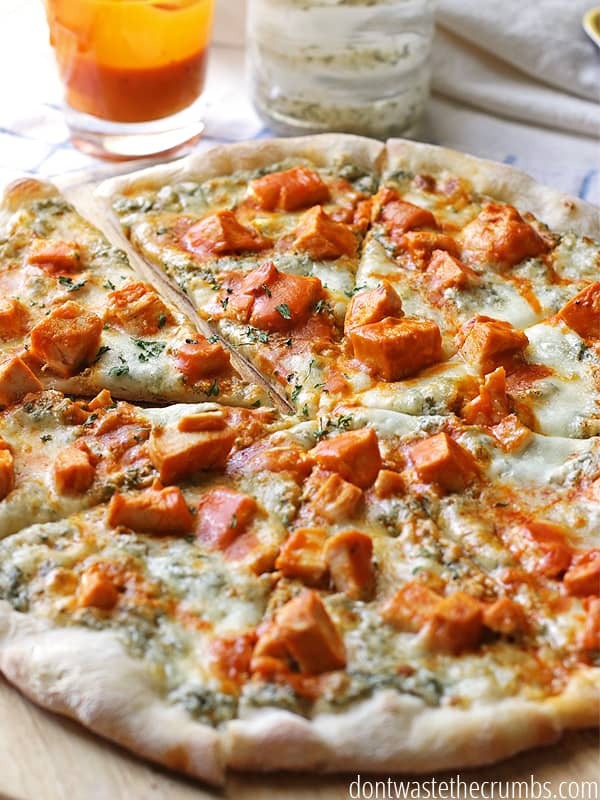 Have you tried buffalo chicken pizza? This flavor combination changed my life, but I’m open to trying new flavors too. What’s your favorite pizza combination? Haha, Margherita’s pizza! Haven’t thought about that place in years! Their pepperoni pizza brings me back to my college days. Thanks for the stroll down memory lane! I guess I’m a hippie at heart and always go for veggie pizza (whole wheat crust, of course) but I love a good pesto pizza with lots of mushrooms and artichokes. Lol – it’s a small world isn’t it? Every time we visit his family back East, we make the 45 minute trek to Margheritas 🙂 Did you go to school at UofD? This recipe looks like something my family would truly love. I’ve never made a pizza from scratch before, so I’m off to check out your pizza dough recipe next. 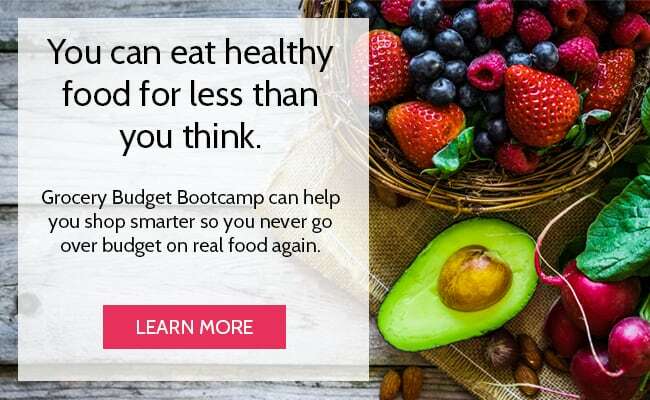 Do you mind my asking, what plugin do you use for presenting your recipes? I was easily able to save it to Pepperplate and that makes me very happy! I use EasyRecipe 🙂 I hope you enjoy the recipe! 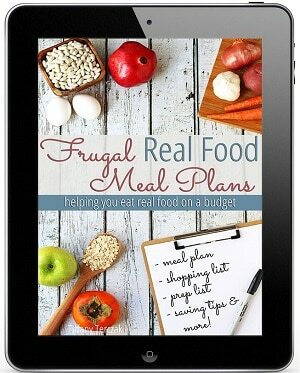 Great alternative to our ordinary Friday night Pizza. Easy and very tasty! Wow! Best buffalo chicken pizza my fiance and I have ever had. Thanks for the wonderful recipe! You’re so very welcome Jean!